Home »	Fix » How to fix Windows Update error 0x80070bc2? Issue: How to fix Windows Update error 0x80070bc2? Hello. I have an Acer laptop with Windows 10 V-1709 installed. I noticed that the Windows Update gives an error 0x80070bc2 error and keeps failing to install cumulative update KB4048955. The same happened with the KB4043961 error before. Could you please help? People come across the error code 0x80070bc2 when checking Windows Update history. For many, it occurred when trying to install Windows 10 Cumulative Updates KB4043961 and KB4048955. When opened, Windows Update history indicates the fact that Cumulative Update KB4048955 “Requires a restart to finish installing.” That’s a kind of a loop because after restart, the update shows the 0x80070bc2 error and reports that the update failed to install. That’s a vicious circle because the no matter how many times the user tries to install the update, the same sequence of events occur. There are many different problems that may trigger the Windows Update error 0x80070bc2. In most of the case, the error stems from the corruption of Windows Update services or compromised Windows update files. In this case, it does not seem that the error 0x80070bc2 is caused by faulty KB4043961 and KB4048955 updates because hundreds of thousands of people installed it successfully. Actually, the reason of the bug may be related to the system’s restart during which some update processes are blocked. In this case, we would strongly recommend you to run a scan with Reimage optimization utility. It will scan the system for corrupted registry entries, damaged or missing system files, and check if it’s not infected with malware. If automatic 0x80070bc2 error fix did not work, try the following methods. Press Windows key + I and open Update & Security section. Select Troubleshoot and find Windows Update. 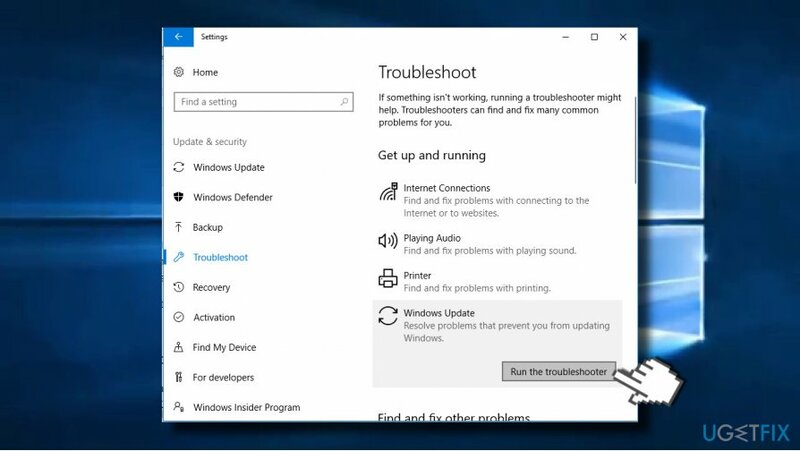 Click Windows Update and select Run troubleshooter. The scan may take up to 10 minutes. You should get a window with scan results and notification if Windows managed to fix the problems automatically. Right-click Windows key and select Command Prompt (Admin). If a UAC shows up, click OK to proceed. Then type Del “%ALLUSERSPROFILE%\\Application Data\\Microsoft\\Network\\Downloader\\qmgr*.dat” command to delete qmgr*.dat files. Once done, copy and paste cd /d %windir%\\system32 command and press Enter to execute the command. 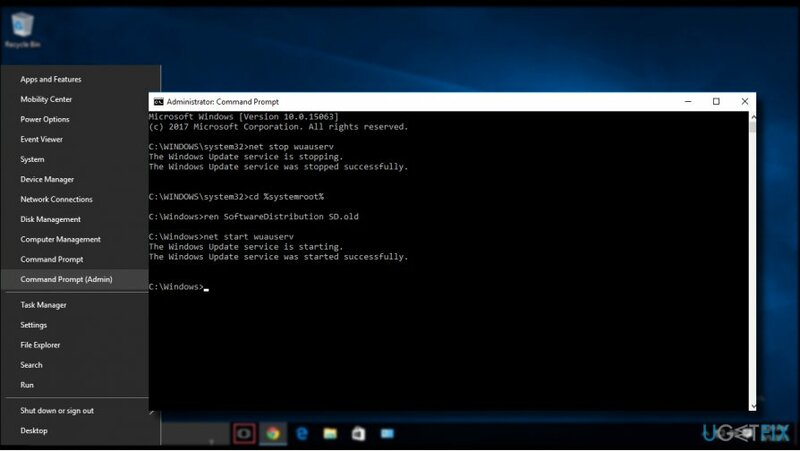 To reset Winsock, type netsh winsock reset and netsh winhttp reset proxy commands. Press Enter after each of them as usually. Navigate to the official update catalog and download the needed update manually. Click on this link to access the catalog and type the code of the update into the search bar and press Enter. Now click Download button next to the entry of the update. Once the update is downloaded, try to install it. ^ Tim Fisher. What Is Windows Update?. Lifewire. Practical advice to help you live better with technology. ^ Gordon Kelly. 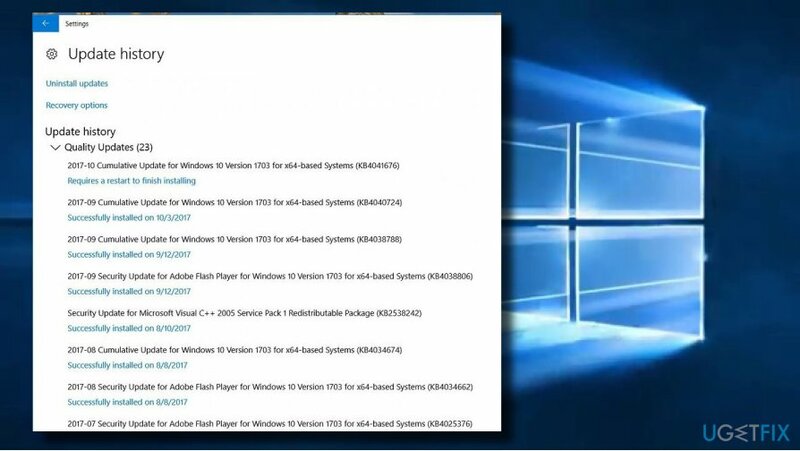 Windows 10 Forced Update Starts Causing Problems. Forbes. Online magazine. ^ Lucia Danes. Malware forecast for 2018: More ransomware, Android & Mac viruses. 2Spyware. The highest-quality information about malware and general security.